Tolbachik (Kamchatka): (18 Jun) KVERT reports no changes in the ongoing eruption of the volcano. Tremor levels remain stable and lava continues to be effused from the southern fissure vent. 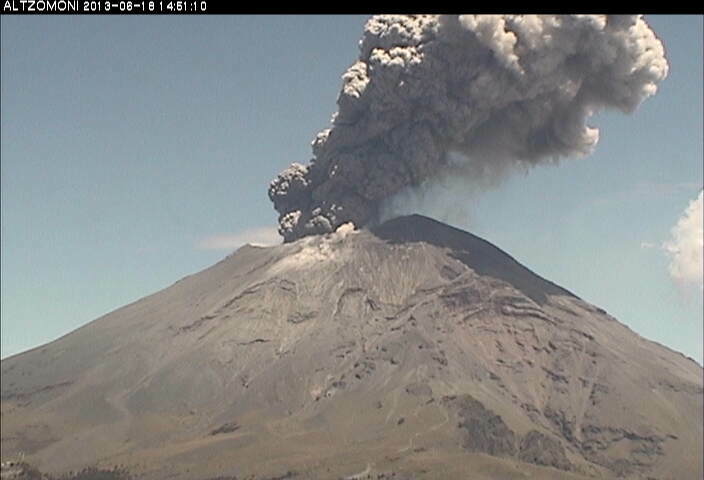 Popocatépetl (Central Mexico): A few hours ago, another moderately strong explosions occurred at 14:48 h local time, which threw incandescent fragments at distances of 100 m from the crater and generated an ash column reaching nearly 2 km in height, which was dispersed towards the northwest. The alert level remains unchanged at Yellow Phase 2. Yesterday's strong eruption ejected bombs to distances of up to 2 km and many ignited bushfires. There were reports of ashfall in Tetela del Volcán, Ocuituco, Yecapixtla, Atlatlahucan, Cuautla, Tlayacapan, Yautepec, Jiutepec y Xochitepec in the state of Morelos, and also in Ecatzingo, Atlautla y Ozumba in the state of México.